April 15th, 2015–The forecast was calling for heavy winds and big swells. So I presented that info to my customers and they all said, “let’s do it!” Well, the forecast was correct. The winds were strong and the swells were big. But that didn’t stop this hardy bunch from going out and having a good time. Oh, and catch fish too. We went north about 7 miles to Ten Mile Beach to nock out our crabbing first and that went really well. We scored limits of nice crabs for 12 anglers. We ran about 20 pots to get them. Then we just went just outside my crab pots and put our lines in the water. It wasn’t too long before we had our first hookup! It turned out there was a pretty good little patch of fish there. We ended up landing 5 fish. 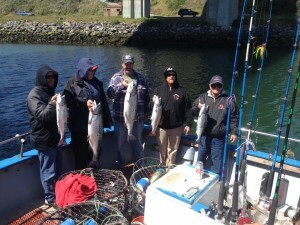 We really didn’t loose any other than the fish that hit and ran and didn’t even give anyone a chance to get to the rod. Great job by everybody. To have 100% recovery in the conditions we were in is just unheard of. Again, great job by everybody. Biggest fish was 18lb 3oz caught by Britt Parks out of Brentwood Ca. 2nd runner up was a 16 lb 13 oz king landed by James Rytych from Rohnert Park, Ca. Fish-On! 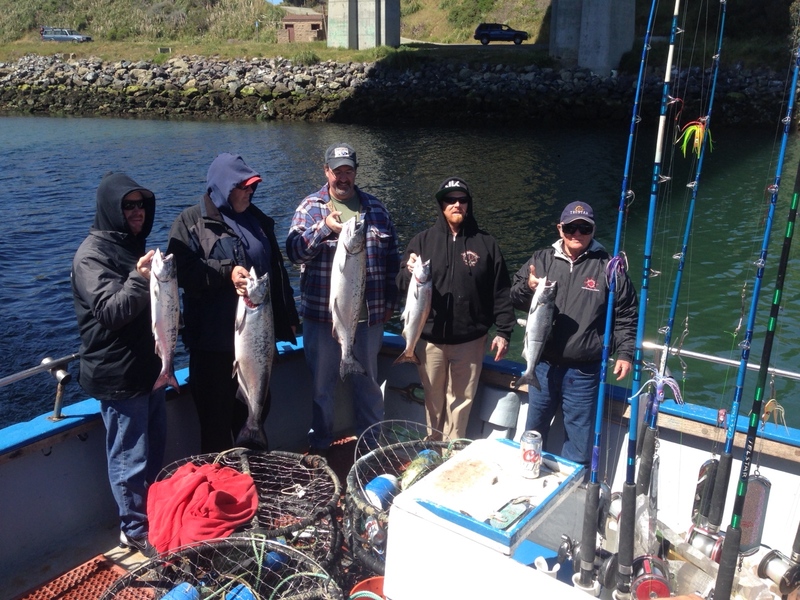 This entry was posted on Thursday, April 16th, 2015 at 3:28 pm and is filed under Fishing Reports. You can follow any responses to this entry through the RSS 2.0 feed. You can skip to the end and leave a response. Pinging is currently not allowed.